Catalonia is the region that houses Barcelona – and if you’ve been watching the news at all you know they’ve been busy protesting their independence this year. From what I understand this region has always considered itself separate from Spain, and have their own language to prove it. Probs other stuff too. This is the only region of Spain I’ve traveled to. Barcelona is a magical city and it was the first and only trip I traveled abroad alone. This felt like a big deal at the time but upon further reflection I don’t know why I didn’t do this more often when I was single. It’s awkward eating dinner alone, sure, but there’s no-one there to judge you when you’ve stuck the 10th pintxo in your mouth. Except for strangers. I suppose it’s like anytime you try something new – the excitement gives you a heightened sense of awareness that you can’t get when you feel safe and comfortable. Everything feels special and memorable, even if it’s just a walk down the street for ice cream. 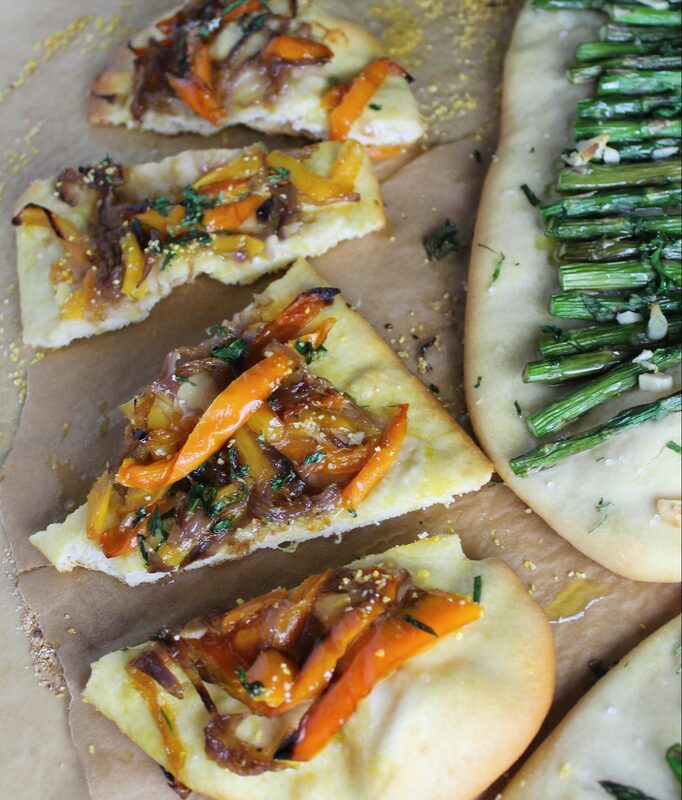 I don’t remember eating flatbread in Barcelona – but I saw this in my cookbook and made damn sure I tried it at home. It’s like a pizza but IT IS NOT A PIZZA. I was very careful not to add cheese to this (it was so hard) but there’s enough flavor going on here from the veggies that you don’t need it. 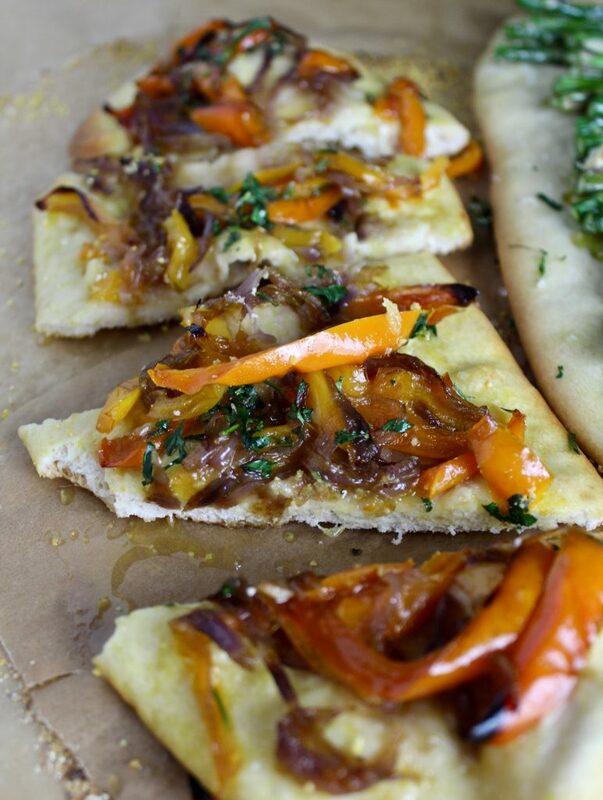 The nice thing about these flatbreads is that the dough hardly needs any time to rise and you can add anything you want to them. I had access to asparagus, peppers and onions at my grocery store. Fennel, greens and other in-season herbs would be good too. Oooo maybe I need to make another batch. Fun fact – did you know the white pithy part of the pepper can make them taste more bitter than if you removed them? Even just a little left on there can ruin the pepper! I learned this in a Spanish cooking class I took in Barcelona. Next time cut a pepper, taste a slice with and without the white pithy part – your world will be forever changed. In a large bowl, add yeast and 1 1/3 cup lukewarm water and stir until the yeast has dissolved. Add the sugar, 2 tsp olive oil and salt – whisk together. Cover with plastic wrap and let hangout in a warm place for 30 minutes or until you start to see foam on top. Then, add the flour and stir to combine. You can knead this by hand (15 minutes) or with a dough hook on a stand mixture (10 minutes). After this, rest for 5 minutes, then knead for another 5. Cover with plastic wrap in a bowl for 30 minutes. Meanwhile, heat 1/3 cup olive oil on a large skillet over medium heat. Add the sliced onions and bay leaves. Cook, stirring occasionally for 5 minutes until starting to brown. Then add the sliced peppers and garlic. Season with salt. Turn heat to low, cover and cook for 20 minutes. Stir every so often. Divide the dough into 6 equal portions, and roll them out into 12 inch long tongue shaped flatbreads. You can add flour to your work surface as needed. Oil your baking pans and sprinkle with polenta. 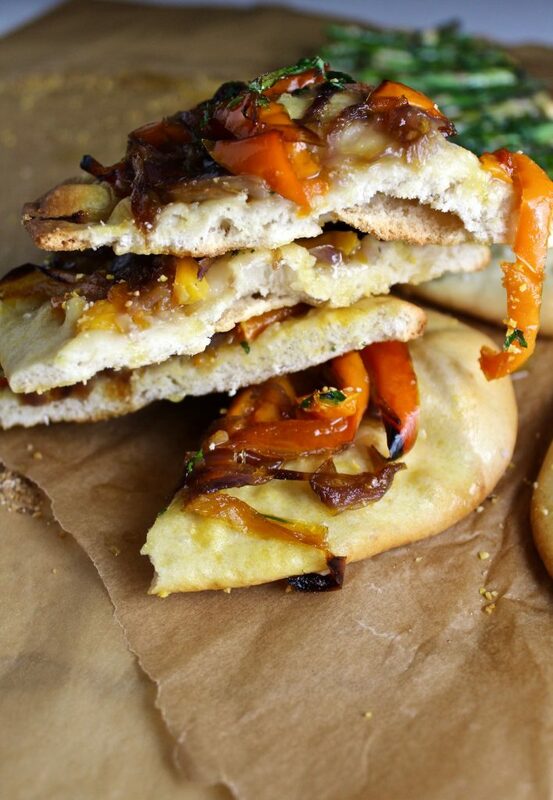 Then lay your flatbreads over the pans. Let these hang out for about 15 minutes. Cut the asparagus into 2 inch chunks, coat with a little oil and salt. 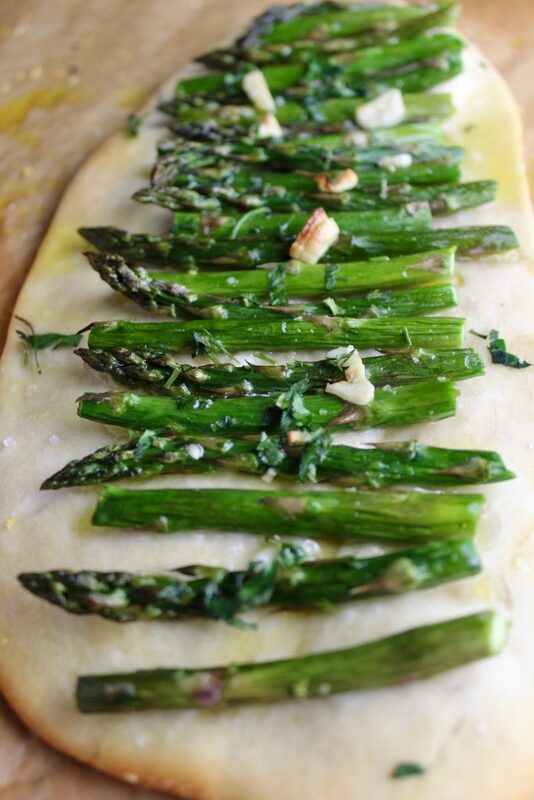 Brush the flatbread bases with olive oil and sprinkle with course sea salt. Top with your asparagus and pepper mixtures. Top with more garlic. Scatter parsley on top. Bake for 12-15 minutes until golden and crisp. Top with more fresh oil out of the oven.